Barcelona motor show round-up | What Car? 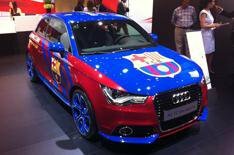 Barcelona Football Club clinched the Spanish La Liga title on Wednesday, and Audi decided to bring along this heavily liveried A1 to celebrate. The new Hyundai i40 saloon made its official world debut here at the Barcelona motor show. For the full story see the Hyundai i40 revealed for more information. Part coupe, part crossover, the Veloster has two doors on one side and only one on the other just like a Mini Clubman. This small crossover concept car is designed to mimic a sprinter on the starting blocks, according to its designer. Find out more about the Renault Captur here. Renault announced this tiny two-seater electric car will cost from 6690 when it goes on sale in the UK next summer. Well be getting behind the wheel of this hotly anticipated 335bhp coupe later this month. The new Rio will be longer, lower and wider than the model it replaces. It goes on sale in the UK in September and will cost from around 10,000. This concept car will become the CX-5 crossover when it goes on sale in the UK early next year. We first saw this sporty A-Class concept at the Shanghai motor show last month, but its making its European debut here in Barcelona. Its the first time Seats IBE and IBZ concepts have been shown together. The similarities are obvious, and show that Seat is keen to establish a stronger brand identity. Toyota hasnt offered anything sporty in its line-up since the Celica was axed back in 2007. Thatll change next year when FT-86 II rear-wheel-drive, 2+2 coupe goes into production.